The Bisons fell in the series finale to the Chiefs, 3-0 from Coca-Cola Field Sunday afternoon. Syracuse scored most of its runs early before tacking on another run in the ninth and held the Bisons off the scoreboard despite the Herd putting together multiple scoring opportunities. The Chiefs grabbed a 1-0 lead in the second on an RBI-single from Jaff Decker. Jose Marmolejos, who registered a four-hit game Saturday night, knocked in the second run of the game for Syracuse in the third on an RBI-double. In the ninth, Bengie Gonzalez added to the lead with a double to score Decker. Herd starter Chris Rowley registered six punch outs in as many innings pitched. The Bisons were held hitless until the third inning when Richard Urena cracked a triple to right-center field. The Herd put runners at the corners in both the first and the third innings but were unable to score in either frame. In the first, Danny Jansen purposely stopped between first and second base which drew a throw from Chiefs' catcher Tuffy Gosewisch. Roemon Fields, who walked to leadoff the game, stole second and third base before attempting to race home on the throw down. However, the ball beat him to the plate by a large margin. In the third, Jansen reached first base again and Urena was on third with two outs, but Alford popped out to put an end to the scoring chance. Fields advanced to third base again in the fifth and the Herd couldn't bring him home. The Bisons went 0-11 at the plate with runners in scoring position and left eleven runners on base. Buffalo batters also struck out ten times collectively and the Herd was held to five hits in the game. 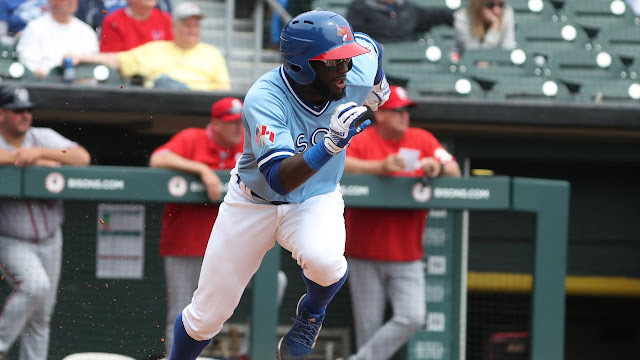 Buffalo now heads into the All-Star Break and will return to the diamond to face the International League North division leaders, the Lehigh Valley IronPigs on the road in a four-game series beginning Thursday night.